Arriving in Cartagena, Colombia we are due to take a 5-day sailboat journey through the San Blas islands and into Panama, Central America. 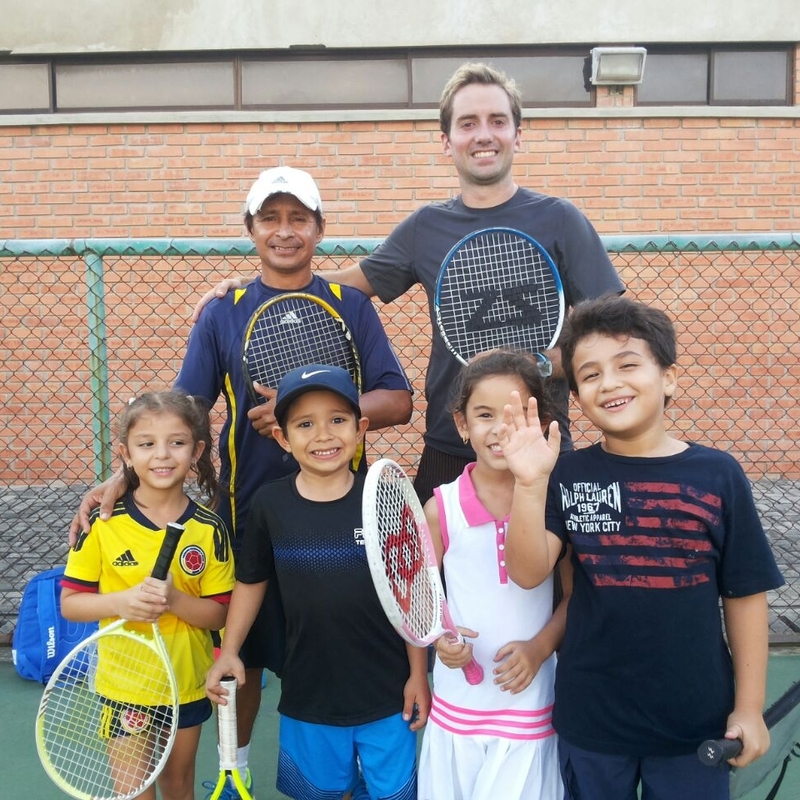 Just when we thought that was the end of South America… I stumble upon a tennis club, Complejo de Raquetas de Cartagena. Here we met the administrator Gustavo and coach Freddy (above; Lee, Freddy, Gustavo and Matt) who welcomed us with large smiles, excited to have some British tennis visitors. Apparently celebrities.. We lapped it up of course. They show us their make-shift nets that they use for delivering their mini tennis sessions, which Gustavo had made himself. Quite incredible. They reacted like our Zsig one had been transported from the future, as we folded it together with ease. We delivered to 4 groups the next afternoon/evening using a mix of our Zsig net and the homemade version. Freddy introduced us to the children and parents, who were ecstatic to meet us. Here we shared coaching ideas with Freddy and tested out the new net and equipment (above). Although not a school or orphanage – there is a clear need for the equipment here, as all of the mini balls were all dead/broken, and they cannot afford to buy more. These sessions are specifically designed for families that cannot afford to play in the local area. Saying our goodbyes, the staff and parents display their appreciation and invited us back again one day. I think we'll take them up on that offer, an incredible place. (Plus I like this celebrity thing). The next morning we take the sailboat from the Cartagena port. The first part of the sail was 48 hours at sea - that tests whether you get seasick or not! It was well worth the journey, as we arrive in the picture-postcard islands of San Blas. Having some fun on the sand with the group we were travelling with (below). After an amusing tin boat ride up a river (almost like a back-door entrance) we arrive in Panama and get a jeep into the City and are immediately hit with the wall of skyscrapers. I immediately wanted to turn around and run back into South America - but realised my time in this city would only be short. Here in Panama City we said goodbye to our friend Lee Escott (below) as he heads back to the UK. A huge thank you to him on this first part of the journey. Without all of his photography, help organising, and assisting the sessions, we may not have been able to get this project off of the ground at all. Even if he is a vegetarian - he's alright. I now look at the projects journey ahead, as we ready ourselves for Central America and Mexico. Many exciting countries ahead on this adventure! Use the links below to follow our journey through our Facebook/Instagram/Twitter feeds.